A recent rumor says that Tommy Ladnier appeared in the 1941 Fred Astaire film You'll Never Get Rich. 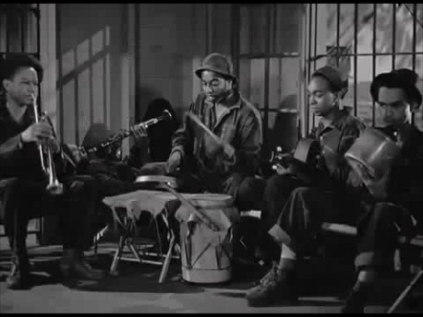 To make chronology work, the rumor also states that the film was edited in 1941 and that Tommy Ladnier, Sidney Bechet, Zutty Singleton and Teddy Bunn can be seen in an accompanying band in one dance scene. In the Fred Astaire film quoted, Tommy Ladnier does neither play nor appear. Nor does Sidney Bechet, Teddy Bunn or Zutty Singleton. The trumpeter shown does not resemble Ladnier at all and the playing is far from his style. The clarinetist is not Sidney Bechet but the playing is (somewhat) inspired by Bechet. However, his vibrato is in fact more resembling Albert Burbank. All this could also be said about the drummer and the guitarist. So the link between this Astaire film and Tommy Ladnier is utterly erroneous. Evidently the musicians shown are not in sync with the film. Another observation is that after the drum break, an invisible big band is playing. The musicians shown are not unknown at all. In fact, many sources do state their real names. The trumpeter is Red Mack, whose real mane was McLure Morris. He was born in Memphis, Tennessee on 18 January 1912 and died in Los Angeles, California14 June 1993. In 1930, he was with Louis Armstrong at the Cotton Club in Culver City. He was with Kid Ory's Creole Jazz Band in the 1955 motion picture The Benny Goodman Story. The clarinetist is well known West Coast reedman Buddy Collette, the drummer is a twenty-year-old Chico Hamilton, the guitarist is Alfred Grant, and bassist Joe Comfort is handling a jug. So the question is really how this far-fetched rumor could have started at all?